This Blade HQ exclusive Protech is a modern update to the classic Harkins ATAC D/A automatic knife. 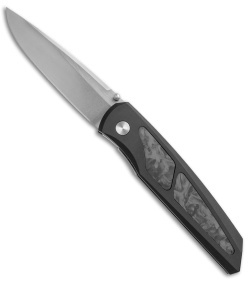 It is outfitted with a black anodized handle, marbled carbon fiber inlays, and a stonewashed blade. The hidden automatic release is located under the topmost inlay for covert opening action. 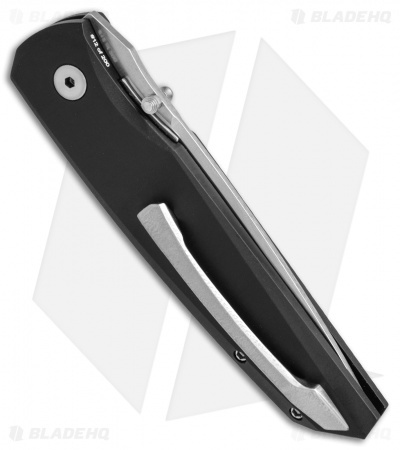 One impressive update you'll notice instantly is the precision milled titanium pocket clip. The Protech Harkins ATAC knife is one of the most functional and reliable dual action automatic knives ever produced. It features a 154-CM blade with ambidextrous thumb studs for manual blade deployment. 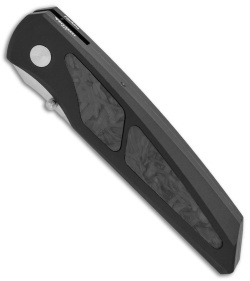 The body is black anodized T6 aluminum with a stainless liner lock mechanism and marble carbon fiber inlays. Beneath the topmost inlay is a hidden button to activate the automatic opening feature. The 8801 has a orange peel finished pocket clip on the back for tip-up carry. Take advantage of this great Blade HQ exclusive item before they are gone! Fit and finish is excellent. Came very sharp although I have received other Protechs that were much sharper. A few minutes stropping and it now shaves hair. The action is great. Not as strong a fire as some autos and I actually prefer the weaker fire IMO. No issues with liner lock on mine. Overall the knife is smooth both firing and closing. It carries very well in the pocket and it's the perfect blade length IMO. I LOVE this knife for many reasons. I own 4 of these Harkin D/As. Adam I will buy your knives at a good price. Great knife. Sharp, smooth, strong. Not as strong a snap as expected from ProTech, only leaf spring fired ProTech I own (of the 10 I own). Liner lock sticks. Expecting smother for the price. Overall fit and finish great, just disappointed by these 2 (IMHO kind of benchmark factors) had to mark off.